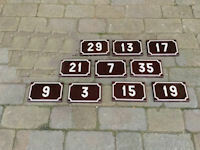 Original, quality 1920's rectangular shaped continental brown enamelled plaques decorated with off white borders and a variety of numbers. Each plaque has a countersunk screw hole to each corner and also mounting slots to the reverse if required. All in superb condition with the odd minor chip. Only the numbers in the picture are available. Complete and in good order. 8.75" x 5.5" x 0.5". Price is for each. Please state which one is required if ordering online. 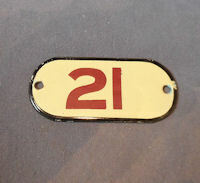 Original, quality 1920's / 30's enamelled plaque, with number in GWR colour. Red numbers on yellow / cream background, with a black outer border and two countersunk screw holes for mounting. Complete and good order. 3.25" x 1.5". Original quality, 1920's, superb oval house number plaques, probably Continental. The dished plate has white numbers on a Royal blue background and has two holes for fixing. All the ones in the picture are available and many more, some minor chips but otherwise in good bright condition. 3.5" x 2.75". Price is for each. Please state which one is required if ordering online. Original, quality 1920's / 1930' unused small rectangular shaped white enamel plaque with red text detailing "Caution while van is occupied always keep Pointer at "off". When leaving van put pointer at "on"Lock Window and Close Door". This example with four screw holes for mounting, is in mint condition. 5" x 2.5". Original, quality pre war unused square white enamelled plaque detailing a caution notice re gas meters entitled "Portsmouth, Gosport and Bognor Regis Gas Undertaking (Southern Gas Board)". 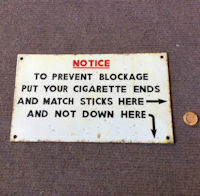 A super sign in mint condition with four screw holes for mounting. 6" square. Original, quality unused pre war rectangular shaped white enamel plate with black text detailing "Drinking Water" in upper cased text. This mint example has four screw holes for mounting and is perfect. 5" x 3". Original, quality unused post war horizontal white enamel plate with two screw holes for mounting and black text detailing "No Circulars". In mint condition. 6" x 1.5". 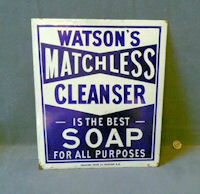 Original, quality pre - war rectangular shaped enamelled plaque detailing 'Private' in upper cased text white on brown. This very clean example has white four countersunk screw holes for mounting and is complete and in good order. 9" x 2.5"
Original, quality, oval shaped white enamel boat registration plate's for use on the River Thames. 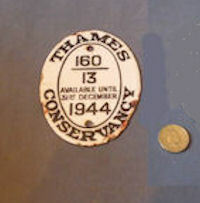 Each one is detailed in black type on white "Thames Conservancy available until 31st December", other details differ for each"- 160/13 for 1944. 3/31 to 1944. 30/12 to 1947. In reasonable condition with some rubbing to the outer edges. The reverse of each has been cleaned and lacquered. Please state which one your require if ordering online. 4" x 3". Price is for each. 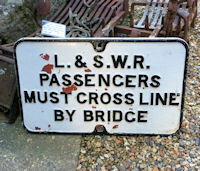 Original, quality 1920's heavy rectangular shaped cast iron sign with embossed text detailing "L & S.W.R Passengers Must Cross line by bridge". This example has two large bolt holes for mounting and has an old black on white paint finish. Complete and in good order. 26" x 16" x 0.5". 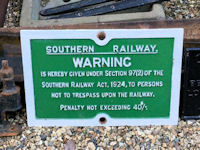 Original, quality 1920's rectangular shaped cast iron sign detailing in embossed type "Southern Railway warning is hereby given under section 97 (2) of the Southern Railway act 1924 to persons not to trepass upon the railway. Penalty not exceeding 40/-. This heavy example has two large mounting holes and has old green and white paintwork. Complete and in good order. 24.5" x 15.75" x 0.5". 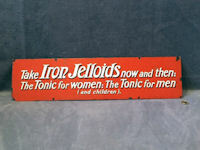 Original, quality late 19th century enamel advert detailing in white on red background, "Take Iron Jelloids now and then, The Tonic for women and children : The Tonic for men". A good bright clear sign but with some edge damage to the enamel and the lower left corner missing, otherwise complete and in good order. 24" x 6". 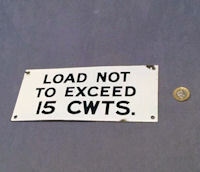 Original, quality pre-war rectangular shaped enamel sign with black text on white background detailing "Load not to exceed 15 cwts". This very clean example has four screw holes for mounting and three small areas of chips to the enamel at the edges. Otherwise all is complete and in good order. 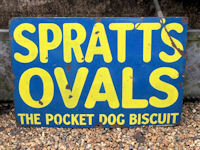 Original, quality 1920's rectangular shaped enamel advertising sign detailing "Spratt's Ovals the Pocket Dog Biscuit" in yellow upper cased text on blue. A good bright coloured sign with one old crease and some minor damage to the enamel at the edges, otherwise complete and in good order. 30" x 20". 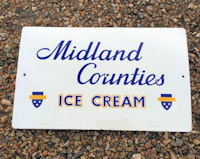 Original, quality 1940's / 50's enamel sign advertising "Midland Counties Ice Cream" in blue and yellow type on a cream background. This very, very clean sign has two screw holes for mounting and one small area of damage to the 'U' of Counties. Otherwise complete and in good order. 24" x 15". 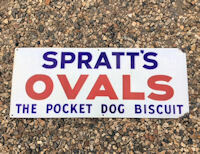 Original, quality 1930's rectangular shaped very clean and bright enamel sign detailing "Spratts Ovals the Pocket Dog Biscuit" in red and blue text on a white background. This near mint example has six countersunk screw holes for mounting and only has a little damage to the right hand corners. 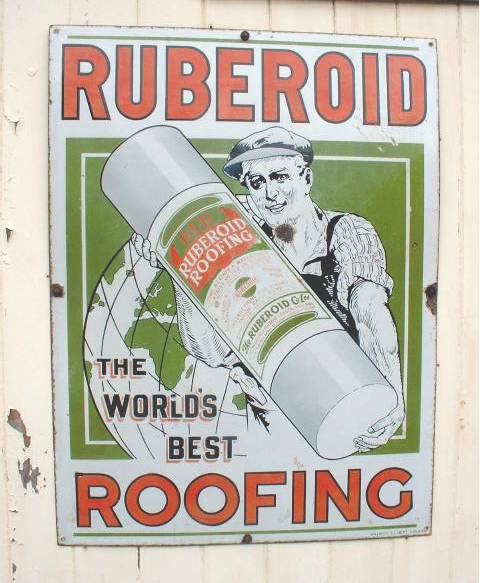 The lower right hand corner is printed for the sign manufacturer "Wood & Penfold Ltd London". Complete and in good order. 30" x 12". Original, quality 1920's / 30's railway enamel sign with white upper cased text on Royal blue background detailing "Season Tickets must be Shewn Here" and to the lower corner in small print "Wildman and Mcgoyes Ltd B ' Ham" for the maker. Some chips to the edges but generally a bright and clean sign otherwise. With four screw holes for mounting. 12" x 10". Original, quality pre-war, small rectangular shaped enamel plaque, with black text in upper case on white detailing "The Property of The North Eastern Electricity Board". A very clean plaque with four screw holes for mounting. 5.25" x 3". Click on photo for lager and other view. Original, quality 1920's, enamel sign, detailing in black upper cased text on white background "Post Office and "Money Order Office, Savings Bank" all within a black border. 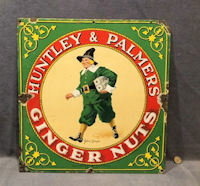 A good bright sign, with eight screw holes to the outer border, but with chip damage to the enamel edges, mainly to the top and corners. 26" x 10". 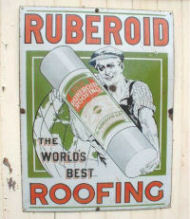 Original quality, 1930's enamel sign advertising "Ruberoid Roofing felt". A clean sign with very minor damage to the enamel and slight fading to the detail on the roll of felt. 36" x 27".